This month, we had the opportunity to speak with one of the best known U.S. experts in the olive oil industry, University of California Cooperative Extension Farm (UCCE) Advisor, Paul Vossen. 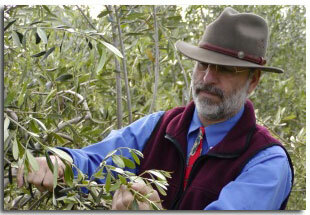 He is well known for his seminal work, Organic Olive Production Manual, first published in 2007. While Paul’s overall focus is pomology (the scientific study and cultivation of fruit), his heart has clearly been devoted to the olive and how best to help California growers create world-class extra virgin olive oil. As a UCCE Farm Advisor in Sonoma County since 1980, Vossen has been deeply involved in the growth of olive oil industry in California for over three decades. Vossen was one of the founders of the California Olive Oil Council in 1990; he started and managed an olive oil taste panel that became recognized by the International Olive Oil Council in 2001; and currently is the panel leader for the UCCE Research Taste Panel in Santa Rosa, CA. His many research projects continue to provide expertise to growers on the effects of irrigation and olive fruit fly damage on olive oil sensory quality, and in identifying the sensory characteristics of oil olive varieties grown in different areas of California. Two local producers came to me to ask how to grow olives. They were planting significant acreage but had no real background in farming, jut a strong interest in growing olives for oil. Around that same time, a Napa grower and new olive oil producer came to me through a soon-to-be-retired UC Davis professor and wanted help in putting together an educational program for olive oil production in Northern California. We subsequently put on several educational seminars and started the "Northern California Olive Oil Council". I studied and researched olive oil production, and in the process, planted six demonstration orchards, and traveled to Europe, Australia, and North Africa several times to learn from the more experienced. Working together for the benefit of the whole industry. Being involved in the development of an exciting new crop varietal with very interesting aspects of adaptability to many growing areas and increasing drought tolerance, while still providing a fresh, healthy, and great tasting product. My greatest interests continue to be in research and education. Current research activities include studying the effects of terroir on oil flavor in different varieties, olive fruit fly control and damage thresholds for influencing olive oil flavor, and olive oil production economics. In the area of education, I am studying land feasibility for oil olives and helping producers to learn how to produce the best possible olive oil – choosing varieties, creating harvest efficiency, understanding fruit handling, and providing meaningful feedback to growers about the characteristics of the oil they are producing. I continue to enjoy teaching consumers about olive oil quality. Summertime in Chile - during our winter months. Unselfish sharing of time and information and being a hard worker. I have several top choices: (1) Toasted LaBrea whole wheat bread drizzled with extra virgin olive oil and a dash of salt; (2) Boiled beans drizzled with fresh extra virgin olive oil and a dash of salt; (3) Bruschetta drizzled with a fresh extra virgin olive oil. I would have to say it was getting the first and only olive oil sensory panel recognized by the IOC in 2001. Recently in Sonoma, I had the best paella ever with fantastic extra virgin olive oil, wonderful local wine, and really good friends. I plan to take a sabbatical leave to travel to Europe and Australia to do some research for a short while, and then finish writing a book on olive oil production, processing, and evaluation - that I have been working on for 8 years.